Starting at 6 pm local time, Saturday, February 20, 2016, a man in a black Chevy HHR began driving around Kalamazoo, Michigan, shooting and killing people. Some initial reports said nine or seven people were killed. It turns out that six did die, as one 14-year-old girl shot at a Cracker Barrel restaurant did not expire. She remains in critical condition in a hospital. The first shooting took place around 6 p.m., when a woman was shot four times in an apartment complex parking lot....She was with her three children. The woman is in serious condition. 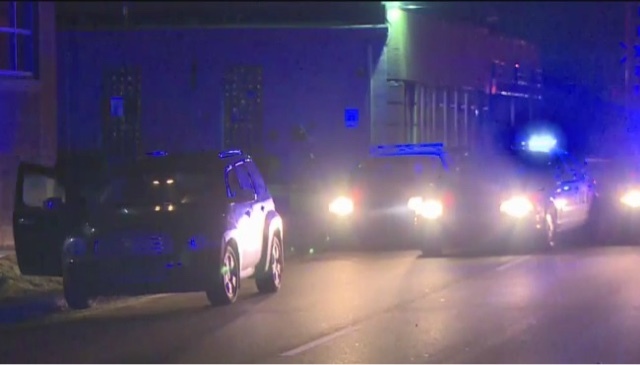 Shortly after 10 p.m., two people were shot and killed at a car dealership....the victims were there looking at a vehicle. Kelly Bainbridge was with her fiance and friends at Bell's Brewery in Kalamazoo when she started getting texts and calls from concerned family members about the gunman. "As the shootings continued to occur, the situation because more frightening," Bainbridge told CNN. She was less than 4 miles away from the dealership. Some of her friends decided to leave the bar, but Bainbridge and her fiance stayed. The brewery's owner locked the doors to protect his patrons. The suspect was arrested about two blocks away from the brewery, Bainbridge said. Source. 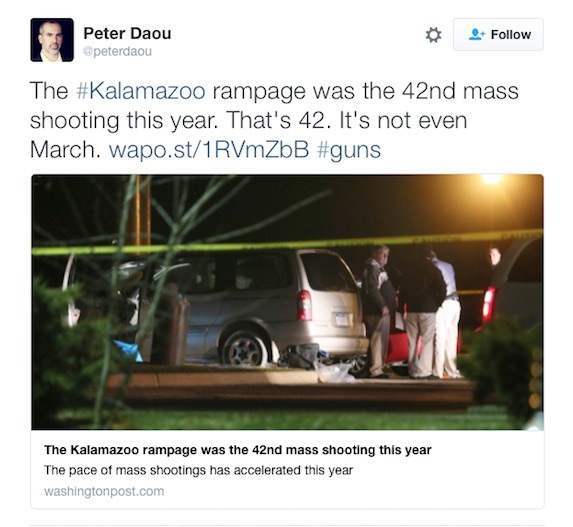 Kalamazoo County, Michigan, prosecutor Jeff Getting said Sunday that there is "no reason to believe" that the shooting rampage was related to terrorism. All the victims were picked at random. The suspect, Jason Brian Dalton, 45, was arrested when his vehicle was recognized in downtown Kalamazoo early Sunday morning. 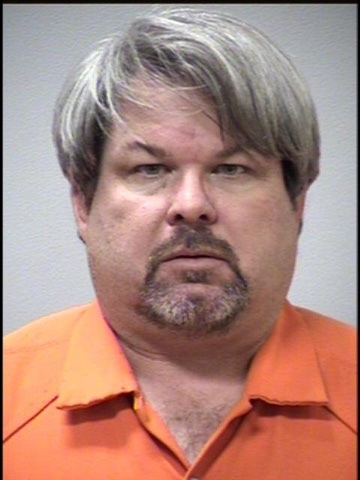 The man suspected of killing six people and injuring two more in a Saturday evening shooting rampage in Kalamazoo, Michigan, was an Uber driver who may have picked up passengers that same evening, according to the ride-sharing company and police. "Jason Brian Dalton had passed a background check, and was a driver-partner with Uber," said Uber's chief security officer, Joe Sullivan, in a statement. "We have reached out to the police to help with their investigation in any way that we can." While the company did not address reports that Dalton picked up and dropped off customers Saturday night, authorities told CNN that it was "certainly part of our investigation." "We're looking into his connection to Uber and whether or not he was picking up fares in between the shootings," said Public Safety Chief Jeff Hadley. CNN. Jason is a common given name for a male. It comes from Greek Ἰάσων (Iasōn), meaning "healer," from the verb ἰάομαι, iaomai, "heal," "cure," cognate with Ἰασώ, Iasō, the goddess of healing and ἰατρός, iatros, "healer," "physician." Brian is a male given name of Irish and Breton origin, as well as a surname of Occitan origin. It is common in the English-speaking world. It is possible that the name is derived from an Old Celtic word bre meaning "hill", or by extension "high, noble." The name Dalton is an English name, with the meaning "from the farm in the dale." The Old English meaning is "valley town." The name "Dalton" is familiar due to the Dalton Gang. The Dalton Gang was a group of outlaws in the American Old West during 1890–1892. It was also known as The Dalton Brothers because three of its members were brothers. The gang specialized in bank and train robberies. The Dalton Gang continues name-recognition because of its popular culture mentions. Originally known as Bronson (after founder Titus Bronson) in the township of Arcadia, the names of both the city and the township were changed to "Kalamazoo" in 1836 and 1837, respectively. The Kalamazoo name comes from a Potawatomi word, first found in a British report in 1772. However, the Kalamazoo River, which passes through the modern city of Kalamazoo, was located on the route between Detroit and Fort Saint-Joseph (nowadays Niles, Michigan). French-Canadian traders, missionaries, and military personnel were quite familiar with this area during the French era and thereafter. The name for the Kalamazoo River was then known by Canadians and French as La rivière Kikanamaso. The name "Kikanamaso" was also recorded by Father Pierre Potier, a Jesuit missionary for the Huron-Wendats at the Assumption mission (south shore of Detroit), while en route to Fort Saint-Joseph during the fall of 1760. Legend has it that "Ki-ka-ma-sung," meaning "boiling water," referring to a footrace held each fall by local Native Americans, who had to run to the river and back before the pot boiled. Still another theory is that it means "the mirage or reflecting river." Another legend is that the image of "boiling water" referred to fog on the river as seen from the hills above the current downtown. The name was also given to the river that flows almost all the way across the state. Source. The Chevrolet HHR (for Heritage High Roof) is a retro-styled station wagon launched by Chevrolet at the 2005 Los Angeles Auto Show as a 2006 model — and designed by Bryan Nesbitt. The HHR shares the GM Delta platform with the Chevrolet Cobalt, Pontiac G5, and Saturn Ion. In Mexico, it was sold alongside its predecessor, the Opel-sourced Chevrolet Zafira compact MPV. The vehicle's design was inspired by the mid-1940s Chevrolet cars and trucks, specifically the 1947 Chevrolet Suburban and Advance Design pickups, with large, square fender flares and a hemispherical grille. The design of the HHR has been credited to Bryan Nesbitt who was a former designer at Chrysler where he was the lead designer of the Chrysler PT Cruiser. The HHR was assembled in Ramos Arizpe, Mexico, and was available for sale throughout North America. In the fourth quarter of 2010, Chevrolet announced that the HHR would be discontinued after the 2011 model year, with the last HHR's available in dealerships starting in late January to early February. HHRs were also available for fleet order until May 2011. Update: Uber riders who rode with Dalton in-between the shootings describe his vehicle as being silver, as it appears to be in the following photo. abstruse angle at Lucern ("lucern" - Latin for "lantern"), Switzerland. been known to shine on "members" of the Dance Macabre painting. take their bows on the Stage of Life. connection with this study. " Apparently J. Frank Dalton was a cousin of the James' Brothers. Also J. Frank Dalton could have been an alias of Jesse of Jesse Robert James, one of the three 'Jesse James', the other 2 being Jesse Woodson `James and Jesse Mason James. Dalton now claims that the Uber App made him do it. Do we now have the Son of Uber as the Son of Sam 2.0? Dalton said when he logged onto the Uber app it "started making him be like a puppet." He told police he would have tried to have a "shootout with police, when the log in went from the black symbol back to the red, that's when Dalton stopped his thought." "Dalton explained to us that when the app changed from red to black that is when he started having problems." He told police during a series of interviews "the iPhone could take you over." He said he "wishes he would never have spoken what that symbol was when he saw it on his phone." According to the report, Dalton described the devil figure as a "horned cow head or something like that and then it would give you an assignment and it would literally take over your whole body." "He said it starts out that you have to follow the navigation, but it gets to the point where you don’t have to drive at all, the cart just goes. He was seeing himself from outside of his body." Dalton talked about the Masons and the Eastern Star symbol. He said his grandmother was in the Eastern Star and his grandfather was in the Masons. Mars Red: A New Red Dawn?